Are there science fiction technologies over the horizon? Yes. 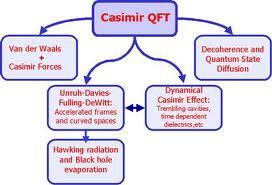 Let me present the CASIMIR FORCE. And suggest, with my characteristic generosity, how to make a machine from it. To understand it one has to visualize this: there are no particles, not fields, only waves. (De Broglie’s) Matter Waves. They are also all over. In particular, the waves are in between two electrically conducting plates, and outside them, too. Between the plates there are fewer waves. Why? Those waves basically die when they touch an electrically conducive surface. So the only waves present, between the plates, are basically like strings attached on both sides (the exact same picture as the “harmonic oscillator”) Thus the frequencies permitted in between plates are few. But outside the plates, the frequencies can be anything. The waves are related to the phenomenon known as “particles”: they carry momentum. As they bounce around, they push. But they are fewer pushing from inside. Hence there is a force that forces the plates to come closer. Basically the vacuum is more vacuous inside than out. The vacuum gap was measured, and it’s called the Casimir Force (Casimir was a Dutch physicist). This is often a bit abusively described as the “Zero Point Energy”. (Einstein and a colleague introduced the notion of “nullpunktenergie” in 1913) I used the term, though, because it makes an excellent slogan. Can one generate energy from Zero Point Energy? Yes. Even lizards do it. How to go to the stars with ZPE? Generate motion. That allows to move magnets, hence generate electricity. To generate motion, connect the plates to springs keeping them apart (but not so far that the Casimir force would disappear). Suppose the plates are made of semiconductor material. Plug in a base current turning them conducive. At that point, the Casimir force turns on, and the plates come closer. When they are close enough, cut the base current: the springs pull back the plates. Repeat. The rest, ladies and gentleman, is just technological details (but that could take a while, as the example of controlled thermonuclear fusion shows: it took 60 years to reach breakeven pure thermonuclear fusion controlled energy production in 2013). In any case, progress is being made in harnessing the Casimir Force. This, in truth, is nothing new. The Casimir Force, in a sense was well-known to mariners of old. Two tall ships in a long swell, but without wind, parallel to each other, would be invincibly attracted to each other, and crash, with catastrophic consequences. Old Mariners Knew The Casimir Force All Too Well. The mathematics, and even the physics are exactly the same. This is a clue that, after all, Quantum Physics may be more natural than usually depicted. And it’s all very natural: geckos, the famous lizards who can run upside down along ceilings, actually use (a variant of) the Casimir Force. In the title, I used “Zero Point Energy” (ZPE). This is a bit dishonest. Einstein himself so strongly disagreed with some forms of ZPE, that he refused to learn Quantum Electro-Dynamics (QED; although he had the best, most dedicated and patient, professor). However, the basic form, as displayed here, is completely uncontroversial (and an experimental fact). The only question is this: as the Casimir Force, following the recipe above, would provide with enormous amounts of energy, with no pollution whatsoever, even in interstellar space, and as it looks just to be a question of precision nanotechnological construction to make it work, why are no massive technological ZPE program in evidence in the most advanced countries? This entry was posted on December 22, 2013 at 10:06 pm and is filed under Energy Physics, Foundations Of Physics, Non Locality. You can follow any responses to this entry through the RSS 2.0 feed. You can leave a response, or trackback from your own site. Astounding nobody mentioned this before! Well done! HAPPY Birthday! 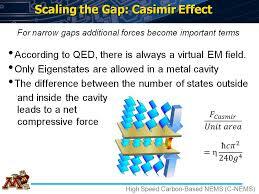 What’s the power of that Casimir force? So there is plenty of power there to tap, light years from any star. However, one could right away use this to produce macro power for MEM robots, as long as one can miniaturize a tiny power source (itself replenished by the CF!!!) and a tiny control system (ought to be possible, as any atom is a clock…). – The resonance state of one of the superposed state experience a phase shift by incoming photon is a *field* issue? The lack of rest mass within spacetime realm make the photon non-algorithmic. If it get the restmass, it makes “spacetime whirlpool” ? It also might lead to loopholes in quantum encryption techniques that rely on photon destruction.